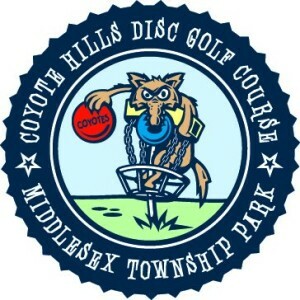 Coyote Hills Disc Golf Course is located in the Middlesex Recreational Park in Carlisle PA at 54 Beagle Club Road, Carlisle, PA 17013 Click here for google maps link. Download and print a score card here. Download and print our Caddy Guide here. The course is an 18 hole Championship course with long pin or tee positions on almost every hole. The designers are making the course bigger and better each year so you may be surprised if you haven’t played here recently. Rolling hills and roped O.B. creeks can make the course tricky. Precise throws are required throughout most of the course, but it opens up in spots and lets the big-arm players go all out. We have a YouTube channel with Course Preview aerial drone footage to show you the course. 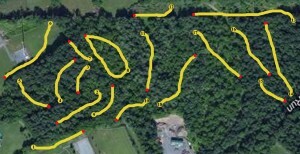 Also Check out Disc Golf Scene and DGCourse Review for details and reviews! The Carlisle Coyotes Disc Golf League hosts many exciting events throughout the year, including our weekly tag league, which meets Wednesday at 5:30pm and Saturday at 10:00am. from Spring until Fall. You can purchase a tag for the season for just $25, which supports the course maintenance costs and the end-of-year finale tournament. Get league updates on Facebook or Check us out on DiscGolfScene.